Receiving an influx of leads from PERQ’s software shouldn’t be a problem… after all these leads could become a customer. Follow these furniture lead management tips to turn those online visitors into in-store sales. When furniture clients begin using the PERQ software solution, retailers most often tell me their biggest adjustment is getting used to the volume of leads that are generated. While this can be overwhelming at times, I’ve helped our clients with furniture lead management, including offering best practices and tips. Using the steps below can help any furniture retailer focus on the most qualified leads and still extract all the value from our PERQ interactive software solution. Let’s talk about how to prepare your team to manage the increased leads seen from the solution. Your sales team needs to first understand how to read the consumer profile data they’ll receive from PERQ. In a consumer profile, we provide all contact information, as well as an aggregate look of every piece of data we have gathered from them throughout the interactive experiences. Although your team will see a significant increase in the amount of leads, they don’t need to directly contact all leads. When it comes to furniture lead management, I encourage retailers to focus on the consumer buying funnel from the bottom-up. This means, reach out to consumers who have told you they are ready to make a purchase now and then work your way up to leads who are still in the research and discovery phases of their shopping journey. The only PERQ leads that actually require follow-up are those from interactive experiences where a consumer has specific requests, such as: Request More Info, Special Offer and Consultation Requests. These lead profiles will include red text alerting you that follow-up is needed. I like to remind clients that If their team can only handle follow up with the leads who go through the interactive experiences, then implement a system to make sure you’re following through. However, if your team has the bandwidth to reach out to additional leads, focus on the people letting you know they’re ready to purchase now or in the next two weeks. If your furniture store has enough resources, there is value following up on every lead, including those from the New Customer Welcome, but again the consumer is not expecting that personalized follow-up since they already get a system-generated email from PERQ. 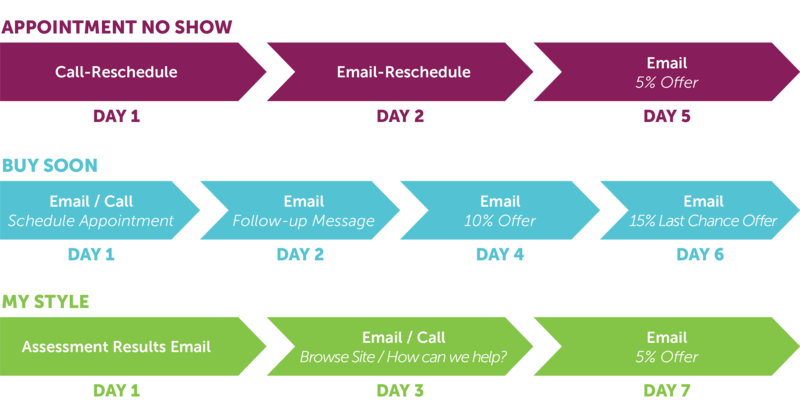 When following up with the leads, the best practice your team can follow is to treat these leads the exact same way you would treat a consumer in store. Clients who get the highest lead to sale conversion rate are those that value the leads generated from their online showroom in the same fashion they value clients in store. It’s important to treat the consumer profile as the first conversation with the client. When reaching out, use that information collected from PERQ’s interactive experiences to continue to inform the consumer on inventory options, or about any other information the client may have requested. We also have templates for how to nurture leads and use the consumer profile generated from PERQ to frame the conversation when reaching out to the consumer. If you are reaching out to a “cooler” lead — or someone high in the funnel — offer education as a means of continuing the conversation. Many people are doing research online prior to coming in store because they’re trying to gather information about their preferences, shopping options and inventory before committing to spending time in the store. If you offer to educate consumers further on their options in a more personalized setting given their preferences, they are more willing to visit your furniture store on their Saturday shopping trip.